Billtown Web's purpose is to assist people in the Williamsport Pa vicinity who desire a web page, but do not yet have one. We can show you a simple method, that you can use to build a '.com' or '.net' web page for about $9/year, and easily update it yourself. Billtown Web can advise you what you need to do -- via instructions on this web page and accompanying videos. As an optional service, we can for a small charge, do the complete process for you of registering your domain name and setting up the web page, and then "turn it over" to you, so that you can easily update it yourself in the future. See Page 6 "We Do It" for details. This is done by (1) purchasing a domain name for about $9/year from GoDaddy.com or a similar low-cost registrar, and (2) using it with a free web page from Yola.com, Weebly.com, Blogger.com, Microsoft Small Office, or or a similar service. These free web pages are very easy to update -- almost like sending an email. Blogger Extras: If you use the Blogger.com web pages, you can even give multiple people "update privileges", each with their own password, and you can even set it up so that a person can update only a single page or two, but cannot disturb anything on the rest of the website. Join our free Yahoo email discussion group "BilltownWeb", where you can swap ideas with other local webmasters. questions about any of this. (570) 322-7597, and I'll return your call. 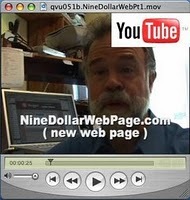 There is an amateur YouTube video that demonstrates how you can use a blog for a web page. There is a 2nd YouTube video that gives an overview of registering a domain name. You can also contact us for a no-obligation, hands-on, "you drive it" demonstration of what you see in the videos.